Camping Krounebierg är en camping i Mersch. Denna terrasscamping har platser med stängsel, med skugga, utan skugga och platser med lite skugga. Det finns möjlighet att hyra husbilar. På campingen finns en lekplats och ett sportområde. För den sportige semestervandraren har campingen guidade vandringsturer och olika cykelleder. Det finns ett underhållning och ett fitnessrum. Vem vill inte efter en hård dag slappna av i en sauna, ett solarium, en jacuzzi och ett ångbad. Campingen förfogar över en simanläggning, ett uppvärmt inomhusbad och ett knattebad. Det finns också en vattenrutschbana. Denna inspektör gör varje år ett besök på Camping Krounebierg och inspekterar campingen för ca 200 faciliteter och för andra förekommande punkter. Inspektören är en medarbetare från ACSI och arbetar inte för campingen. Very expensive camping (ends up costing as much as a decent hotel), surroundings poor with high voltage power line in spite of being in one of the most beautiful regions in Luxembourg. Heating in Bungalow very poor - avoid cold nights or bring very warm clothes for the night. Football pitch terrible. Unfriendly staff, wanted to charge us for things we had not broken. Swimming pool nearby at walking distance which is good, but not the best swimming pool in Luxembourg. Restaurant only open for dinner (too cold to use the great terrace) and prices very high, like at a good restaurant in town. There are definitely better campings around. Very well run and friendly site where the staff were multilingual. Facilities kept immaculate with everything working correctly. We stayed here in off peak in early October. Reception staff were excellent, pitches large and well laid out. Short drive to railway staion for regular trains into Luxembourg city. Free Wi Fi was good but only availble in or very close to camp site Clubhouse.Would certaintly stay here again and reccommend a stay here to others. The most hospitable host met us at the door after our long late journey and it just got better from there! Nothing was too much trouble for him, charming, helpful and gracious. The site was immaculate and the plots were truly enormous! In all our years of caravanning we have never seen more spacious private plots. The food in the restaurant was excellent both times we visited. Luxemburg area itself is very pleasant and gentle but nothing stunning. Lovely feel to it though. Please visit, well worth it. Vill du boka campingen Camping Krounebierg eller få mera information? Det går bra med nedanstående uppgifter eller via campingens webbsida. 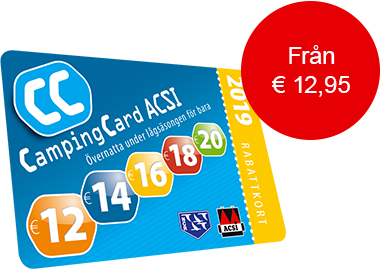 ACSI Eurocampings skickar din informationsförfrågan till "Camping Krounebierg".